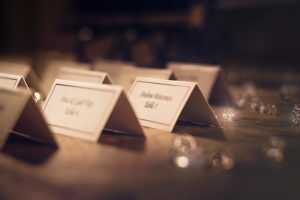 There is often a fine line for brides-and-grooms-to-be when it comes to honoring those who have been lost. Unfortunately, loss is part of life and the wedding day does tend to be one of those events when those losses are really felt. This is why many couples decide to do something to memorialize their loved ones on their big day. However, no one wants the somber reminder to cast a lingering sadness over the special event. There are ways, though, to ensure those who have passed are still remembered. Not every couple chooses to have a program for their ceremony, but it might be something to consider if you want to create a memorial for lost loved ones. This is a great place to put information about the couple, the schedule for the day ahead, and to include those pictures or sentiments about those unable to attend. This is a quiet way to pay homage to those who have passed, particularly if those individuals are grandparents, parents, or siblings of the bride and groom. A seat marked reserved at the ceremony, with the name- or photo of the person is a great way to pay quiet respects. This traditional wedding element provides a fabulous way to keep your lost loved ones close to your heart on your wedding day. A piece of jewelry or clothing inherited can serve as your ‘something old’ or ‘something blue’, and a piece borrowed from the widow or widower that once belonged to your loved one could certainly be the ‘something borrowed’. If you want the memorial to be something that all guests are aware of, consider dedicating a song to a lost loved one, or incorporating a story about that person into the wedding toasts. Do try to choose an upbeat song or story, as this will help prevent the somber mood that you were hoping to avoid.